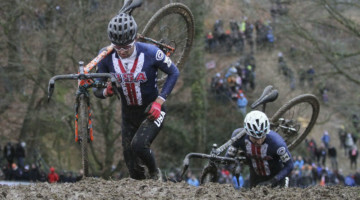 Last year, Stephen Hyde had a breakthrough season, storming to win the second day of the KMC Cyclo-Cross Festival in Providence, and traveling to his first-ever World Championship. 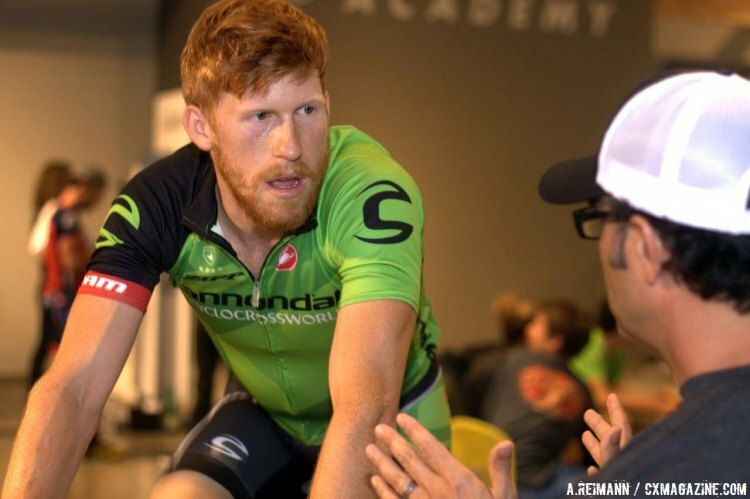 A month and a half later, Cannondale p/b Cyclocrossworld.com announced that he would be joining the roster for 2015-16. We caught up with him at the cyclocross team camp to discuss offseason training, going to the first World Cup on American soil at CrossVegas, and his season goals. Unlike many athletes who don’t like creating or sharing benchmarks, Hyde was completely open about what he hopes to achieve for the 2015-16 season. 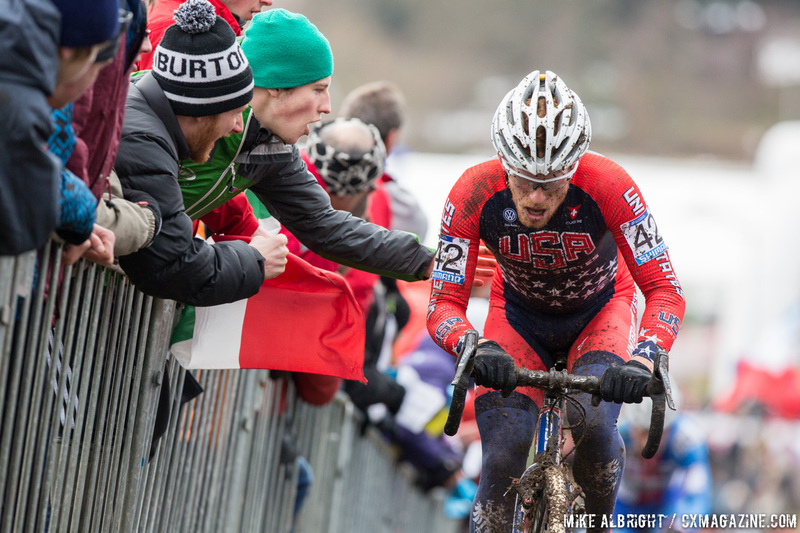 Cyclocross Magazine: How has the training been leading up to the cyclocross season? Have you been balancing road and mountain biking? Stephen Hyde: I start usually around speed week, I do a lot of crits to get the snap back in my legs after the base training, and then I transfer over to road to go back to some depth, and then I go back to crits to regain the snap. I make sure I take a few breaks here and there. If I’m racing for two hours, I make sure I take a couple days off my bike. I’ve only done one mountain bike race in the last five years. I haven’t even owned a mountian bike for a while. I was using Al [Donahue]’s for a bit, and I would try and get in three times a week, a lot of the times after a road ride. 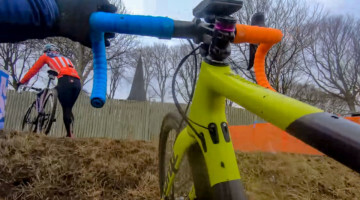 CXM: Is there a date you set where your cyclocross bike is your one and only? SH: There are certainly blocks of it where I won’t touch another bike, just because I don’t want to mix different setups. I think this is most important during the base portion of training. If I’m doing 30 hours [per week], I really try to limit the major changes in position. Your body can only adjust so much, so if I’m doing 30 hours of riding, I’ll be on that cyclocross bike for 30 hours, even if I’m throwing in a little skills practice a few times per week. 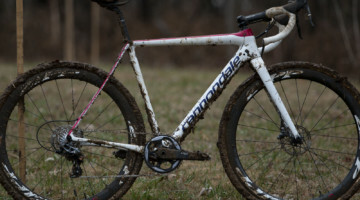 CXM: How has the transition been from JAM Fund to Cannondale p/b Cyclocrossworld? SH: Awesome, although the JAM Fund never made me go three stories in the trees. [Editor’s note: The night before, both the pro and development teams went on an adventure course, and Hyde wasn’t ashamed to admit his fear of heights.] It was such a great transition. I didn’t even have the bike before I found that I could call Stu [Thorne], ask for something I needed, and it would get overnighted to me right away. Now that I have the bike and meet the staff, it’s absolutely fantastic. 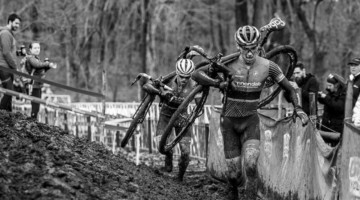 CXM: What would you consider the biggest takeaway from the preseason cyclocross camp? SH: Finding out the depth of the team. We have the four riders on the pro team, and there all big hitters, any one of them can win a race. Especially with Tim [Johnson] and Ryan [Trebon] around, there’s so much knowledge here, whether it be about the races or travel. Any one of those guys can talk about the history of racing, which is importainly for me to learn on. I think even more importation is the inclusion of the Devo team. We get to hang out and have fun with those really talented riders. I think it adds a little responsibility on our part, which is something I took away from my last program as well. I think that it is important to know that it is not just about us. It keeps everyone grounded. It also add momentum and fluidity to the program. You’re adding that to someone that might be keeping you on your toes. I like coming to Cannondale and seeing the support they have. With this team camp, we’ve seen 150-plus employees here, and talked to all of them. Having SRAM here, as well as others who make the industry work. I feel very secure. I don’t feel nervous. Being a mechanic for so long, and wrenching for others in the past, I always felt like I was also in a support role. Now all of this stress and anxiety is gone because I really trust these guys. CXM: Providence was an amazing result last season. Has the bar been set? SH: Absolutely. That was my pinnacle win of my career. Sure, some people weren’t there, but everyone else was, and you can’t take anything away from that. I knew where I was physically, and I know where I am now, and I’m even stronger. Sure the bar has been set, but I’m not worried about it. We’ve been there, done that, and it’s time to move on. CXM: Is there any benchmark goals you set for the season. SH: Yea, I always do, I set training goals, and it’s do or die. I know it’s corny, but I literally have a chalk board above my bed, where I can mark off what I’ve done when I wake up. Now that I’m into the World Cup program, I’m psych’d for Vegas. My goals really are the top 25 in the World Cups. I never raced Vegas, but it’s my style of course. I’m getting beyond just being a grass crit racer, and I’m excited about that. My last one is to win a C1 this year. Ideally it would be Providence. That would be really amazing. It’s not 100% going to happen, but I want to make it happen. Rochester isn’t a part of my skill set, but I’ve been working on it. It’s mainly power vs. weight. I’m catching up with my aerobic volume, and I’m racing against guys above my level. The climbing gets to me, but I’ve focused less on courses that don’t suit me and more on making myself working with those courses. CXM: Do you think a lot of Americans will head to Vegas with pride on the line? SH: I think so. There will be plenty of Euro guys there, and there will be more media there. For me, Vegas has some aura around it, because I’ve been there to watch it. It has been my dream, and watching those guys, I remember thinking how fast they were, and now I know most of those guys. I hope a lot of people have as much pride in that, especially with it being the first World Cup in the U.S.
CXM: Thanks for your time.